One of my rugby teammates turned up for yesterday's game with a carrier bag full of wild hops he'd picked for me. There's just over a kilo. I'd like to try a green hop beer with them seeing as it's the first time I've had my hands on green hops. I haven't got time to do it this week though so I'm thinking that I'll freeze them until I have got time. 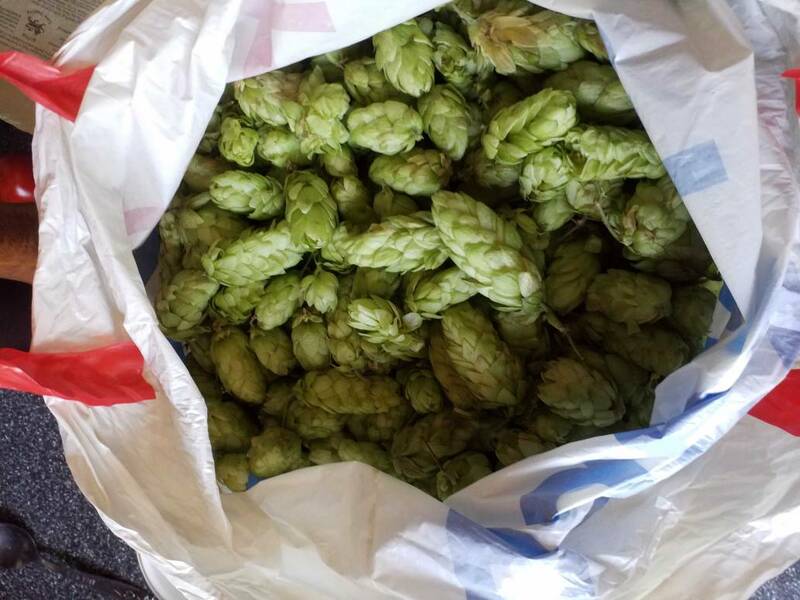 Any suggestions for a green hop recipe? Any idea how they compare to dried hops in terms of how much to use? I work on the basis of 4:1 green:dry. How I do it is bitter with a bought hop so you know the AA% then lob about 1 third in at 10 minutes then put the remaining 2/3 in at flame out. We were boating through Hillmorton locks, near Rugby (Warwickshire), a couple of weekends ago and I noticed loads of wild hops alongside the towpath. Harvested some and then found another lot of the off-side of the canal that smelt a lot stronger than the first lot so I got a load of them as well. Ended up with 114 grams once they were dried. To see how they compare, I brewed a batch of pale today using exactly the same recipe as the last brew which used Cascade hops I had grown on an allotment but substituting the Hillmorton hops. Looking forward to comparing the two when the brews are ready. This year was excellent for hops I could not pick all the wild ones I found and the cascade I grew up the drainpipe was so lush that my hands were yellow after compacting them in kilner jars for storage. I put 1g per litre at 60 mins into my last iteration of Robs Pale ale and will dry hop the bejebbers out of it in a couple days. Hope to have something in the glass by end October also have more cascade plants than I know what to do with now... easy to propagate from cuttings I found. Brewzee wrote: ... easy to propagate from cuttings I found. Would you care to expand - is that cuttings from above ground or the roots? I'm seriously considering revisiting Hillmorton to get a sample of that stock because the hops were so nice. Thanks for that, I'll try and visit Hillmorton again.